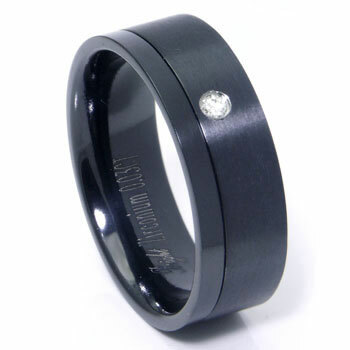 Black zirconium is a scratch proof and hypoallergenic material. It is lighter than tungsten carbide and heavier than titanium. Rating: 5 / 5 , based on 4 reviews. This ring is like NO other. It is beautiful.. my fiance just loved it!!! One thing I have to say is though... inside the ring the company has a TITANIUM Kay logo on it. so if you want to inscribe it.. it may be difficult, for they already is one in there. However this did cause an issue for me,, but not enough for me to return it. I love this ring. And the shipping was prompt. I will definetly be shopping here more. We love this ring, it looks gorgeous on him and matches mine perfect which is black diamonds. Thank you for a wonderful wedding band! I bought this ring for my boyfriend and he loves it, it's a hundred times more beautiful in person, amazingly fast shipping, great customer service.